Summary: Whisking you back to the shores of her bestselling Beach House series, Mary Alice Monroe weaves together a tale of the struggles and triumphs of the historic Rutledge family of Charleston, South Carolina. Beautifully wrought and rich with keen insight, this is an illuminating tale of new beginnings, resilience, and one family’s enduring love. It's becoming a bit of a tradition for me to read one of Mary Alice Monroe's novels while I'm at the beach. Fortunately, I had received a copy of her latest Beach House series book, BEACH HOUSE REUNION. I thoroughly enjoyed this novel; and I love Ms. Monroe not only brings her characters to life, but she also writes about important environmental issues. BEACH HOUSE REUNION brings Cara Rutledge back to her beach house on the Isle of the Palms. Cara has both wonderful and painful memories of her home, but she's coming back this time with some major changes. Cara is starting new career and a new role as a mom; and she feels like her beach home, where she is surrounded by family and friends, is the best place to do these things. Cara isn't the only one facing some changes. Her niece Linnea has recently graduated from college and not sure what she wants to do or where she wants to live. Her father has high expectations for her, but Cara isn't sure she wants that lifestyle. She decides to live with Cara, babysit her cousin, and join the turtle team for the summer... and in the process, she ends up meeting a surfer guy and falling in love! I have only a read a couple of books from this series, but rest assured, BEACH HOUSE REUNION works well as a stand alone -- so you can jump right in! And you'll want to jump into this book (or even this series)! I love following the Rutledge family, with all of their complexities; and I especially appreciate how this book focuses on the balance between humans and nature. I don't know if reading this book at the beach made a difference, but I really, really liked it. I loved both Cara and Linnea and their stories, and this novel just made me feel good because they realized how to work past their issues and eventually discover things about themselves. It was a rough road at times for both women, but their friendship and individual strength allowed them to eventually find happiness. It's a heartwarming story that focuses on what's really important in our lives -- love, family, and friends! Once again, Ms. Monroe has managed to bring the Isle of the Palms to life in a way that makes readers want to head to the beach. (Lucky me that I was already there!) I love how she brings her setting to life, but more importantly, I love how she raises awareness of the endangered loggerhead sea turtles. (Each chapter begins with some information about them.) I have to say that these people who are devoted to protecting them are unsung heroes! I think BEACH HOUSE REUNION would make a great book club selection especially during the summer months. The book is engaging and easy to read... and absolutely perfect for a summer read. I was happy to find a reading guide with fifteen engaging questions as well as some ideas to enhance your book club. For example, there are links to more information about loggerhead sea turtles. In addition, there is plenty to discuss including family, women, strength, friendship, finding one's self, courage, parenting, love, relationships, new beginnings, and more. 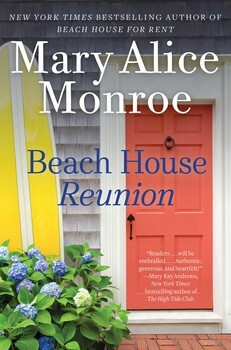 I definitely think Ms. Monroe's Beach House series is a must-read for fans of women's fiction. Highly recommended! I love this series and this author so much. I love a book about south carolina beach life!